Why do some pockets of vines hold onto their leaves longer than others? Here in the Cahors, the whte stone reflects the heat back up, also the south facing slope. Spoke to ‘la vinticultiste’ who reckoned it was because these particular vines have their roots well nourished by a rich water current, rich in nutrients. 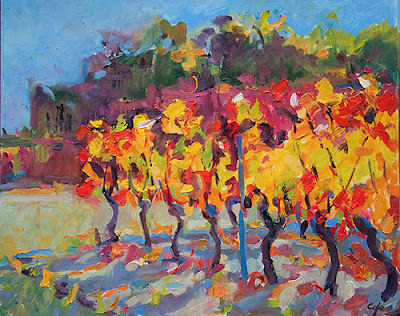 Blue skies, sun shine through the vines, the last saturated glow of this autumn, one of the sunniest that I’ve known.